Personal protective equipment should be one thing above all else: safe. We ensure that uvex products actually exceed the necessary safety criteria by conducting extensive tests on the material. We not only examine samples taken from our finished products, but also look at all components, from the raw material and prototype to the accessories. After all, our products can only be sold when we are certain that they offer the level of protection we claim and have proved this by conducting the relevant test procedures. We have set up a number of testing laboratories to ensure we always remain within the threshold values set down in the relevant standards and fulfil our own generally much higher quality demands. This blog series gives an interesting insight into their everyday work. Starting with our textile testing laboratory at UVEX SAFETY Textiles in Ellefeld, Germany. Under the management of graduate chemist Kerstin Schüller, this laboratory primarily conducts physical tests and quality assessments of textiles, components and ready-made goods. By having its own test expertise in Ellefeld, uvex gains valuable knowledge for R&D projects, as well as being able to inspect raw materials in a targeted way, compare uvex products with those of competitors and monitor finished products. The method is mainly applicable to woven textile fabrics, PE laminates and fleece fabric. 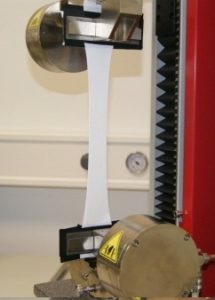 Two sets of test specimens are cut as defined in the test specifications, creating ten samples overall, of which five are taken against the warp and the other five against the weft of the material. The samples are prepared and clamped into the tensile testing machine. Samples are then stretched at a constant rate of extension until the specimen fails, so when it breaks. The maximum tensile force which is measured equates to the maximum force that is recorded in the experiment. The results of the measurements are based on either the mean value of breaking elongation, both weft and warp samples, or the lowest value recorded. There are two methods for determining the tear force of fabric: the trouser-tear test for flat woven textiles and the trapezoidal methods for non-woven fabrics such as fleeces and laminates. In both cases, ten specimens (five weft and five warp) are prepared for the test and cut to size as per the respective norm specifications, creating either a piece that resembles a pair of trouser legs or a trapezoid specimen. This test measures the force that is required to propagate a cut, in other words the tear growth. The results of the measurements are based on either the mean value of breaking force, both weft and warp samples, or the lowest value recorded. This testing method is used for flat-woven textiles and ascertains the abrasion rate, which is equivalent to the number of cycles or rubs the material can endure. 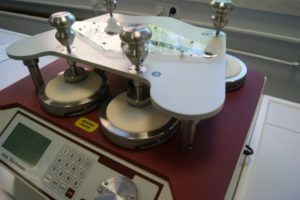 Circular specimens are subjected to rubbing motion against an abradant (MD 100) at a defined pressure (9 kilopascal or 12 kilopascal). A defined wool fabric is used as the abrasive agent (reference abradant) and is mounted on the abrasion machine. 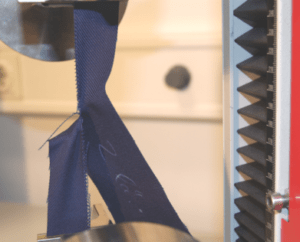 The abrasion test is conducted at fixed intervals until the breakdown point of all specimens is reached – in woven fabrics, this point is when two separate threads are completely broken. Fibre analysis is carried out by examination under the microscope. The result is derived from the mean of four samples. 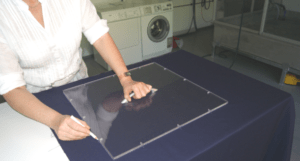 This method determines the dimensional change of textile articles when subjected to normal washing and drying procedures. First , the original length and width dimensions are measured, after which the samples are washed and dried according to the specifications. After washing and drying, the specimens are again measured and used to calculate dimensional change between the starting and finishing measurements in per cent. The next blog entry offering a brief insight into the complex world of material and product testing methods and procedures will be published soon. If you would like to ensure you never miss a post, please subscribe to our RSS feed or like and follow us on our Facebook page.